Gaia’s review of Visa on The Non-Blonde inspired me to pull out the full bottle of EdP I’d been offered, which had remained in its cellophane wrap after a couple of in-store spritzes had failed to convince me. Though often attributed to Germaine Cellier (who authored the earlier, ground-breaking Robert Piguet fragrances Bandit and Fracas), Visa was in fact composed by Jean Carles, and it’s pretty much got Jean Carles written all over it : this is a less spicy version of Dana’s Tabu. The aldehydic top notes (almost evaporated in my flacon) and floral heart are all but smothered in Synarome’s Animalis base, a dense, feral mixture of civet, castoreum, musks and possibly costus (which smells of dirty hair and fur), smeared into sandalwood and some leather (though not an isobutyl quinoline leather type), to which are added some aromatic notes. Visa was originally launched in a leak-proof flacon with a green and red plaid box especially created for air travel, hence its name. Animalis -- which, according to Luca Turin, and I agree, would be good enough to market as a fragrance in itself -- is still produced by Synarome, though not, of course, with animal-based materials. To get a whiff, try YSL Kouros, État Libre d’Orange Vierges et Toreros or Rosine Twill Rose, though the contemporary fragrance that comes closest to the original Visa’s indecent beastliness is Veroprofumo Onda (review coming up soon). 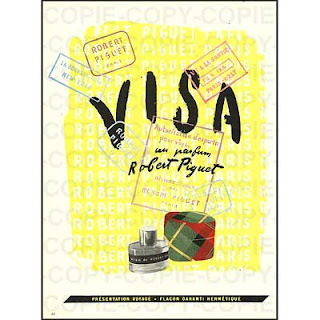 The modern Visa, however, bears no reference whatsoever to the original, unlike the new Baghari which is a riff on the original, and the two flagship fragrances Bandit and Fracas, which the current licence owner of the Parfums Robert Piguet tried to reproduce as faithfully as possible with the help of Jean Guichard, head of the Givaudan perfumery school – both fragrances never stopped production, and though they’ve undergone some changes (the new Bandit in particular is nowhere near as feral as the old one), they’re still entirely recognizable. The all-but-forgotten Visa, in all its glorious pungency, was deemed unsuited to modern markets, and there certainly aren’t enough original Visa wearers around to complain. 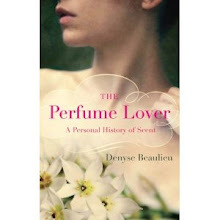 The new formula doesn’t even pretend to be inspired by the old one: as The Scented Salamander’s Marie-Hélène noted when it was launched (Tania Sanchez concurs in The Guide), Aurélien Guichard’s composition leans closer to his own Chinatown for Bond N°9; Bois de Jasmin's Victoria, in her own review, stated that Visa owed its structure to the Angel school of perfumery: fruity top notes (bergamot, mandarin, vineyard peach and pear), sweetened with ethyl maltol (the candy-floss note) on a patchouli base. But then, so many fragrances have been compared to the epoch-making Angel that this doesn’t really mean a great deal. As Gaia writes, the fruit here isn’t of the cheerful, cheap, mall shower gel variety: it’s got that slight over-ripeness you find in certain chypres, especially latter-day ones like YSL’s Champagne/Yvresse. I do get a whiff of unlisted nuttiness at some point: could be prunolide (also know as nonalactone or aldehyde C-18), with its prune, dusty nuts and coconut facets: it is found in some vintage chypres like Femme, and could contribute to the retro vibe the new Visa gives off. Apart from the rose, which somehow adds to the greenness, I can’t really detect a lot of florals here (ylang-ylang and orange blossom are also listed in the notes). 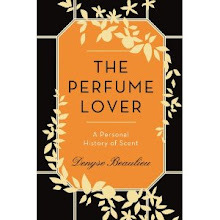 With its patchouli, sandalwood, vetiver, moss, vanilla and benzoin base, it could be classed in the hybrid family of the “chypre gourmand”, which sounds like a mess but somehow resolves itself through the addition of immortelle, with its curry-maple syrup facets, matched with the basil facet of mandarin (which is what sets it apart from other citruses), the green earthiness of vetiver and a leather base. As a result, though the new Visa cannot compete with its forerunner’s dark animalic growl, it does give off a similar feel of density: but rather than feeling like you’re rolling around with a tiger, you might feel, with its burnt umber, burnt orange and deep green shades, as though you’d been offered a sweet-savory feast in the autumn sun. Image: 1949 Visa ad from Okadi. Joe Garces is more savvy than generally admitted and takes an active interest in the fragrance heritage he is directing (he was very graceful when he mailed me a propos my Bandit review, of which as you know there are also several versions circulating and he made a good impression of someone who cares about le métier). This is the fate of Piguet frags he explained, mainly because of the change of ownership of the brand and the limbo phase they went through. Visa managed to float competently (while Cravache made less of an impression I'm sorry to report). Of course the animalic facets of almost any modern creation are bound to be subdued and mollified. As I had noted in my Onda review two summers ago, that one is a man-eating tiger, calling us to "revert to a time of pre-lapsarian carnality with no shame". It is very rare nowadays that such an unsettling bestial timbre can be heard clearly. At least the new Visa manages to smell good instead of merely pleasant and that's something. I can confirm that Joe Garces does care, and passionately, about perfume and about the Robert Piguet brand. I like Cravache less as well but then, I've smelled a couple of versions of the original and it's a good masculine fougère, but neither a masterpiece like Bandit and Fracas, nor a remarkable fragrance like the original Baghari and Visa. So despite what Luca says in The Guide, it's perhaps less of a loss if the new Cravache is a far cry from the original. I couldn't envision such a deeply animalic fragrance as the original Visa being launched outside a very niche line such as Vero Kern's. Though with Bandit, Robert Piguet has a very distinctive and controversial composition, its positioning is somewhat beyond the "niche-confidential" and its products are meant to appeal to a much wider audience that Veroprofumo's. I do think the new Visa is very lovely while remaining distinctive enough to be part of a "larger than niche" line. I know you meant to indicate the new one wasn't as remarkable as the original, but your rolling around with a tiger description intrigues me. If the tiger were real that could be quite terrifying, but it also makes me recall a giant painting of a tiger with a hot dog shaped tongue my mother used to have. I still like the idea of paintings having tiny chambers to emit fragrance. True enough, Cait, rolling around with a tiger would be terrifying, unless you were a tigress or this was in a dream, where the tiger would just be a big, beautiful, friendly purring cat (the original Visa is definitely bigger than a house cat). What a strange, surrealistic painting your mother had! It would definitely be fragrant. I was surprised to find myself enjoying the new Visa (pineapple scares me) but it's not too sweet and, while as you note entirely different from the original, it's still a credit to the brand. I think Joe Garces is the man who came to the Sniffa in NYC? He was a boatload of fun. And he said regarding Visa, as Helg put more eloquently, that Piguet isn't running a museum and they want to honor the house while keeping current with the times. I think they struck a nice balance. March, Joe's a big husky guy with a real Noo-Yawk accent and lots of enthusiasm. He *is* fun, and funny! Visa is just on the side of gourmand which I can live with and enjoy -- not at all the same as Guerlain Guet-Apens, but that level of sweetness. ... I would have liked to have been able to experience the original Visa's animalic growl. Sounds right up my alley. I am tagging you to participate in a meme. See instructions on my blog. Vous avez été taggée, à votre tour!